This is for a written pattern only. I will be working on a chart pattern that will be included at a later date. Pattern works up to be 60 inch octagon. 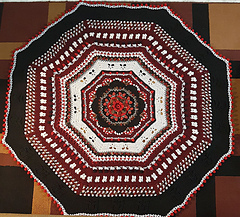 You can follow the first 6 parts of my garden romp for this afghan, I will be working on a video tutorial to continue making the rest of the octagon. This pattern has been tested by 3 people but may still have errors, I will be going over the pattern in greater detail when I work the video tutorial. If you find any errors before then please let me know.